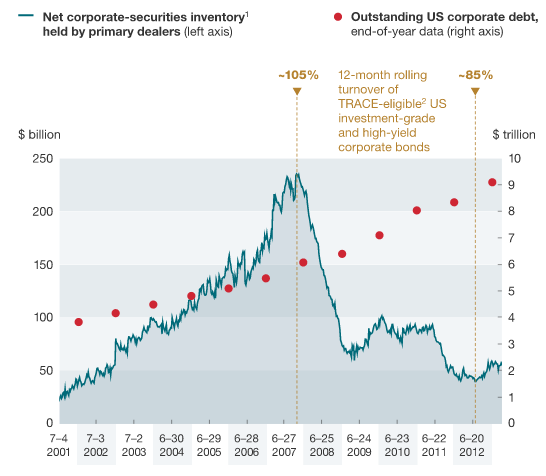 The corporate bond market is charactorised by huge number of bonds in issue, most of which are bought and held and not traded, making it very hard for investors to find the required liquidity to exit positions. We covered this drop in primary dealer bond inventory in a previous post talking about Citi’s new client-to-client bond platform. 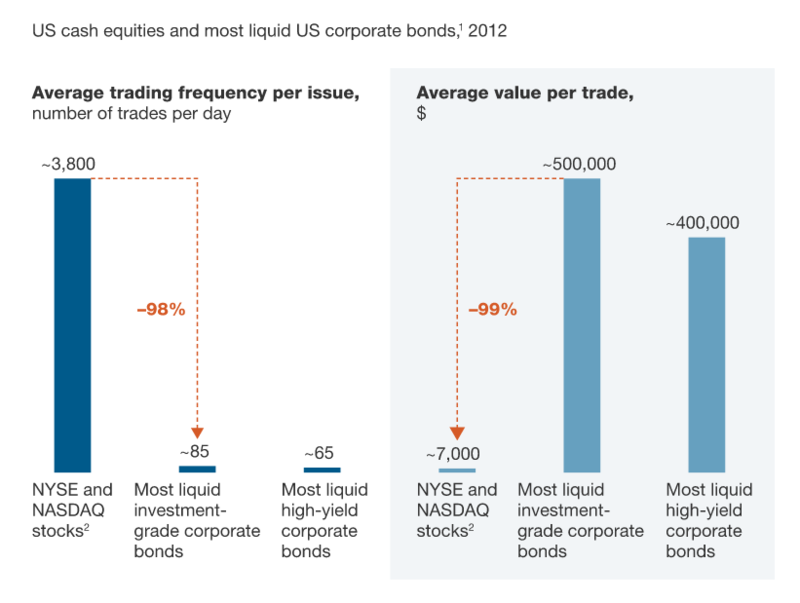 If liquidity remains poor, then that may accelerate the slow but steady migration toward e-trading. At present, most transactions are done over the phone, with dealers acting as counter-parties to investors (that is, the market is quote driven). Many dealers and others, hoping to capture more trading activity in this capital-light world, have introduced new e-trading platforms. 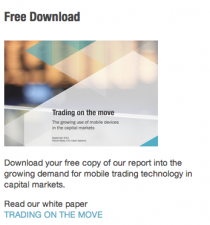 However, success has been elusive, and some broker–dealers have redoubled their e-trading efforts in the wake of the recent sell-off. Develop a centralized pricing and trade-processing infrastructure that serves both traditional and electronic channels, thereby reducing time to market, vendor-specific infrastructure, and costs.Ultimately, this central infrastructure should help dealers to navigate the market landscape efficiently and to maximize opportunities for crossing (or matching) buy and sell orders. Dealing houses need to consolidate their myriad data interfaces and to store data in a centralized, accessible manner, ideally in a single “golden source.” This approach will help firms to feed pricing engines more quickly and effectively, to develop new trading strategies, and to better inform the sourcing and placement of corporate bonds. Such a tracking system should be integrated with sales tools to make the sales force more effective. Finally, banks should provide incentives that reward sales reps for shifting uneconomical trades and clients from voice to e-trading channels. Motivate the right sales behavior will free reps to deliver more valuable services, such as exploring the needs of clients, generating trading ideas, providing market commentary (or “color”), and offering counsel on complex trades. However, banks will need to attract, cultivate, and retain a new breed of sales talent, with the skills to meet the demands of a new era far removed from the old one, in which dealer inventory largely drove the sales function.